My wife (who has been known to refer to herself, at times, as a Twidow) often says that the people I am tweeting with are “not real”. I, of course, know that they (or at least the majority of them!) are. Confirmation of this, if required, came on Wednesday evening at the Lex 2011 Tweetup (#Lex2011Tweetup) when virtual became in real life (often abbreviated on Twitter to ‘IRL’). I had already met many of the Twegals (legals who tweet) that attended. I had organised or been at much smaller Tweetups (with no more than 6 Twegals present) or one to one meetings with a number of them. The Lex 2011 Tweetup surpassed all expectations though with 77 Twegals giving a RSVP on Twtvite. 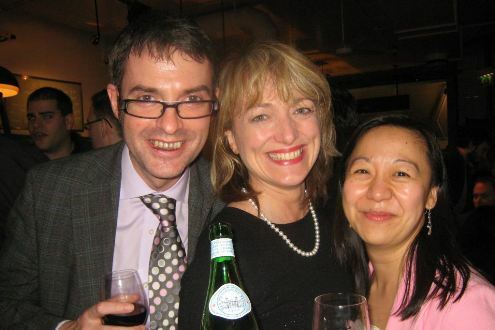 This particular Tweetup started life as a desire for me and Linda Cheung (@LindaCheungUK) to meet at the end of Day 1 of Lex 2011 (at which I gave a talk on Inksters’ experience of using Twitter). For how it grew to what it became see Linda’s blog post: Twitter Clinic: A hashtag case study. Linda has also documented the evening very well (including pictures) on the Connectegrity Blog: Lex2011Tweetup: All the leading tweeting lawyers in a bar. How could it not be fun? Likewise, you can get another very good account of the evening from the perspective of a ‘Tweetup virgin’, Jean-Yves Gilg (@jeanyvesgilg), who blogs: Tweet forth and multiply. For me it was great to meet again (although in some cases all too briefly) the Twegals I had met before, such as @Azrights, @ClareRodway, @clarinette02 (although I had hoped to meet for the first time @clarinette01 and @clarinette03 ;-)), @ElliottBurton, @GavWard, @HeatherTowns, @JohnAFlood, @ljanstis, @London_Law_Firm and @michaelscutt. I had spoken on the phone with @chrisdaleoxford about e-Disclosure and it was good to now meet him (I recognised him by the hat from his Avatar which he wore to the Tweetup). Then there were the Twegals that I had known through Twitter from my very early days of Tweeting and was, at last, meeting for the first time. This would include @colmmu, @filemot, @IkenCEO, @jonathanlea, @MotoringLawyer and @RupertWhite. A special mention, in this category, must go to Tom Valenti (@ValentiLaw) who as a result of tweets with me about the event changed his flight plans and arrived in London from Chicago a little earlier than planned especially for the Tweetup. Tom was a kind sponsor of Inksters’ Habitat for Humanity Global Village Challenge to Argentina. It was great to eventually meet him at an event like this (where he knew many other UK Twegals). He also arrived in London in time to hear my talk at Lex2011 and we were able to spend some time during Conference breaks having a good chat. I also had the pleasure of meeting other Twegals that I had been following or tweeting with for some time or indeed, in some cases, relatively recently. This would include @AlexandraHa @AnyaPalmer @aligeary, @andrewneligan, @AshleyConnick, @benwheway, @conscioussol, @DavidAllenGreen, @dylanwhite, @jeanyvesgilg, @kevinpoulter @lawyercatrin, @legalbrat, @legalfutures, @markbower, @TheNakedLawyer and @petergroves. There were some Twegals that I encounterd for the first time IRL but was not yet following on Twitter. I am now following @barneyc, @markowen1 @stephengodsell and @taffydavies. Some Twegals did not make it to the Tweetup but were at Lex 2011 so I managed to meet them for the first time earlier in the day: @ChristianUncut, @JoannaMG22 and @SteveKuncewicz. @leahdarby who had organised Lex 2011 came along to the tweetup with some colleagues from the Ark Group. Whilst I tried to say hello to as many Twegals as I could there were invariably ones that I didn’t manage to meet. I believe that @ailsa_dixon, @BrettTechLawyer, @grabbeh, @LegalBizzle, @PropTwit, @RedStarKim and @TheLawyerKaty may have been there but I don’t think I met them IRL. There will be a next time (more on that later). In the case of Brett Tech Lawyer and Legal Bizzle it may remain a mystery as to whether or not they were there and if so under what guise. Apologies to any Twegals who I did meet IRL but have not mentioned. I can recall at least two whose Twitter names I am not sure of. Likewise to any Twegals who were there but I did not meet and have not mentioned. Drop me a DM and I will edit the post to include you. Then there was of course @LindaCheungUK. Whilst we were co-hosts we only said a brief hello at the start of the event and then did not manage to chat at all during it! Rather ironic given that the Tweetup arose from a desire for us to meet IRL. We will make amends for this at the next Tweetup (more on that later) when we will not have hosting duties to perform. The evening took Twitter engagement to a new level. We all know (or should know) that the key to Twitter success is engagement. Now that engagement became an even stronger kind as discussions ensued that were not limited by 140 characters at a time. It was not unlike what Twitter is though. It is feasible that everyone in the room might be on Twitter at the same time one evening and there would be discussions going on between groups of them which others would join in with. People would leave and others would arrive. However, there is something rather nice about this real life engagement that Twitter itself simply cannot capture. Having said that if it was not for Twitter the Tweetup would not have happened and you could not have a Tweetup every night but you can logon to Twitter every night if you so desire. The Lawyer Magazine (represented at the Tweetup by @lawyercatrin and @TheLawyerKaty) will have noted the lack of ‘Big Law’ at the Tweetup. No Allen & Overy or Norton Rose. Again this demonstrates, as brought out in Law Firm Twitteratigate – The Whole Story, that broadcasting rather than engagement is unlikely to lead to much on Twitter. Without engaging on Twitter you are unlikely to find yourself at a live networking event where the ‘real’ law firm Twitterati can be found. A score of 5.79 out of 10 was given to the venue. So we could do better on this front. The venue, for this particular event, was however chosen for its closeness to the Lex 2011 venue and before we knew that such a huge number of Twegals would be attending. How was your overall experience? Any comments / suggestions? So noise and venue size seem to be the main issues. It was a shame that a couple of Twegals did not find the Tweetup (not sure how one was “denied access”) and this could be resolved in the future by having a dedicated and signposted area for it. 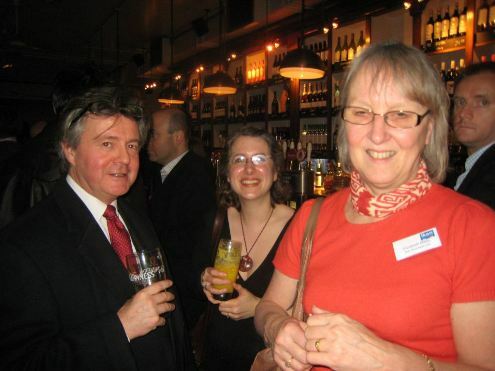 Linda and I have passed the baton to Shireen Smith (@Azrights / @ShireenSmith) and Steve Williams (@MotoringLawyer) to organise the next Twegal Tweetup (#TwegalTweetup). We (Linda and I) may return to host the #Lex2012Tweetup. Should we have a dedicated room to segregate the Tweetup from other people who are out for a drink? Should we have name badges with real name and/or Twitter name? Should there be food? Conscious Solutions (@conscioussol) very kindly provided sharing plates on the night from their marketing budget which was gratefully received. I noticed several tweets at the end of the night mentioning going to find food and in one case specifically a Kebab! Should we seek sponsorship for drinks/food or does this go against the grain of what Twitter is about? Having said that you do now have sponsored tweets so why not a sponsored Tweetup? If there is no sponsorship should there be pre-payment and/or payment on the night to cover drink/food? How often should such a large Tweetup take place? Quarterly or Half Yearly? Do we avoid the summer months and have the next one in the Autumn? What day of the week is best? Will Twegals network on a Friday or is mid week best? Do we have to be careful that too much organisation may remove the “flash mob lawyers” element as one Twegal has called it? But, there again, do we want to be flash mob lawyers? Do provide your comments below in answer to these questions and do raise any other points you may have to assist Shireen and Steve make the next big Twegal Tweetup even better than the first one. Tom Valenti on 20/03/2011 at 8:51 pm. Thanks for the mention on this. I truly appreciate the invitation you extended and all that you did to make this happen. It was a great opportunity to meet the many fantastic people I have come to know on twitter, and, then, so many new people as well. Mark Owen on 20/03/2011 at 11:41 pm. I thought the venue worked well and the lack of informality (no need to book, no fee, people buying rounds) was a good thing. If it becomes more organised then it may run the risk of losing its sense of randomness. No badges meant we were forced to talk to people to find out who they were and what their experence of twitter was, which was all really interesting. Name badges might encourage old school working the room, constantly scanning for a more interesting name, it’s very refreshing to be at an event where we don’t all have preconceptions based on where someone works. This is along the lines of @legalbizzle’s post about anonymity. Mid week is I think better, and perhaps from 7pm so people can grab a bite first if they want. 6 monthly may be fine, as there will doubtless be other events springing up anyway . Victoria Moffatt on 21/03/2011 at 9:01 am. I couldn’t attend the tweetup – real shame, it sounds to have been great. In terms of date – Friday or Monday would be best for me as I’m northern based (not, admittedly as northern as you!). However, I would need to take a day off work to attend if in London again. Unless anybody would be willing to consider a change of location? Or even a northern tweetup in addition? Jonathan Lea on 22/03/2011 at 2:21 pm. Thanks again Brian for what I’m sure will be the first of many such events. I agree that name badges would be a bit too formal and it seems to be more effective to keep things as simple as possible. I think its best if you have one event every month (e.g. every last Thursday) and people take it in turns to organise each one – the attendance and involvement will only grow. I don’t have a problem with sponsorship – for some of the groups I am involved with the sponsorship normally comes from business’s owned by members or contacts of members and will usually mean either one or more of the following: food is covered, we have a free venue, the drinks are covered, travel is covered for interesting speakers etc. We’ve also managed to get students involved with the recent Cornwall Social Media Cafe events – they’ve already started helping with organisation. The three groups above all also have facebook pages and twitter feeds. How about the http://www.twegaltweetup.co.uk site using meetup software? Andrew on 22/03/2011 at 8:22 pm. Brian – I don’t know if we count as “big law”, but you would have had a representative from @MacfarlanesTax – I was hoping to come along after Stuart Popham’s talk at the LSE – but unfortunately something else came up. Sorry to have missed you all. Another time, perhaps. Laura on 23/03/2011 at 9:55 am. I’m with my colleague Andrew (who commented earlier) – I would have come! As an event organisor, tried and tested rules dictate that a mid-week meeting is best; ask everyone who comes to throw in a fiver/tenner for food (personally I would prefer to pay on the night rather than faff in advance – keep it informal and friendly); name badges good; and I don’t think quarterly drinks is too often. John Flood on 24/03/2011 at 1:23 pm. Brian–it was a great evening. When I told my colleagues at the university I was going to a tweetup they looked puzzled and laughed. Well, their loss! Some snacks would be good too. But on the whole a central venue is excellent and our last venue worked well. I like meeting tweeters I know and new ones also. 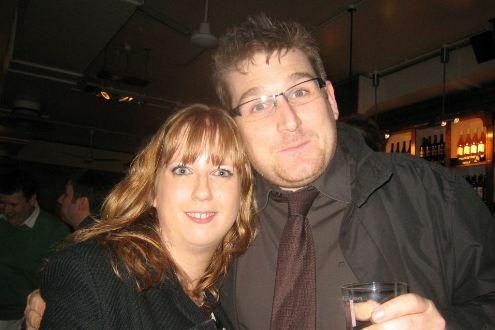 Clare Rodway on 25/03/2011 at 9:28 pm. Brian, a fantastic evening as I’ve said to you already. Hard to critique. 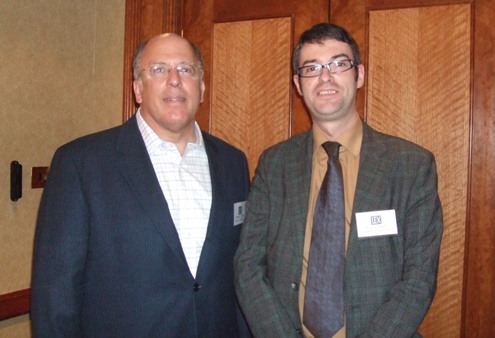 Just one point I’d make – the physical environment wasn’t that conducive to networking. The area was very narrow and we were all spread out along the length of the bar. Felt rather like trying to network in a tube carriage! Other than that, perfect: good company and great to play my new favourite business game of matching real and twitter identities! Thanks for laying on. very much looking forward to the next one! Ali Geary on 27/03/2011 at 10:36 am. Thanks to both @LindaCheungUK and @BrianInkster for organising the tweet up I think it worked really well. It was wonderful to meet some people I had been tweeting with for a while IRL and to find new tweeps with very worthwhile and interesting feeds. It has taken me a little while to put up this post and I must apologise to Brian for this. It did not take me too long to answer the questions posed and I deal with them below. The questions I have been pondering and hoped to share some thought on are a) what motivated me to attend the tweet up and b) what motivates me to want to attend another one. This, I thought, might be the key to giving my opinion on how the event should look in the future. I am aware that lots of people attended the tweet up for lots of different reasons and that I do not speak on behalf of anyone but myself. As I am sure most others reading this post do, I attend quite a large number of networking events, particularly in the last few months with such interest in the Bribery Act. When returning to the office it is usual that I would share what happened at the event by producing a short report for my colleagues. In this, I would normally consider the objective of attending the event, the outcomes and any follow up required. I thought I would attempt to do likewise for the tweet up and share it with others who attended. However, this proved difficult. As so many others have said long before I was @aligeary and an egg on a blue background, the benefits of social media tools are not always as easy to measure. This got me researching blog posts on the measurement of success on Twitter (but that is perhaps not for here). So, did I have any objectives for attending the tweet up? From a professional perspective the answer has to be no, odd given it was a tweet up of individuals in my profession. On reflection my objectives were purely social. I read a lot of blog posts and tweets written by twegals that I follow and I was very interested to meet them IRL. I am sure that that this was a common objective among people attending the tweet up and will remain the case for many attending such events in the future. For this reason I think it is important to keep a level of informality at these events. If the tweet up is brought closer to a more formal style of networking event, held away from a social environment and with name badges it will surely lose some of its appeal. What were the outcomes of the tweet up for me? At the event I met some of the people I already tweet with and got to learn more about them. We were able to have conversations we may not have been able to have on Twitter. I also met people I have followed for sometime but never engaged with before. Meeting IRL has made engaging with these tweeps a lot easier. For example Brian Inkster, who I have followed for sometime but had not started a conversation with him. Now poor Brian is unfortunate enough to have me leaving extremely long comments on his blog. The tweet up has also allowed me to meet other twegals who I had not come across before. I was able to do in one night what it would take me a month or so to do on Twitter. It is for these reasons that I would certainly want to attend another tweet up for twegals. So I knew why I came in the first place, what I got out of coming and why I would come back. The curveball came when discussing the event with other lawyers not on Twitter. The question many had relates to a wider issue. If you are a lawyer using Twitter as a business development tool why would you wish to spend considerable periods of your time talking to other lawyers on Twitter? What about your clients and contacts? I know this is something @markgould13 has shared some useful thoughts on. Of course there are some who do not use Twitter as a business development tool and others whose clients are other lawyers, but for those who do I have no easy answer to the question. It is wrong to assume that all Twegals are the same on Twitter and there is certainly plenty of opportunity for referrals from other lawyers and profile raising. There is also a lot to learn from the experiences of other lawyers and how they are engaging with their clients online. I get a lot of helpful information about our profession generally through engaging Twegals working for our legal press. I have met some brilliant academic lawyers and sought out articles from them that have been very useful to me. There is also something nice about being able to discuss over lunch with a contact working in-house how much he enjoys following the wonderful @legalbizzle. I am not sure a separate room is entirely necessary but having not met many twegals before I did worry I would miss the event because I did not recognise anyone. It may have been helpful to have a separate area to help to identify people. In particular, to avoid people turning up and not being able to find anyone. For the reasons above, I am not sure name badges work as it feels overly formal. I also rather enjoyed the opportunity of finding out who people were and whether I was following them without name badges. I don’t think having food would add anything particularly. If the venue serves food the option is there for people. I am quite used to being at evening drinks events with little or no food. Should we seek sponsorship for drinks/food or does this go against the grain of what Twitter is about? I quite like the idea of no sponsor. Again, I think it would detract from the social element. Also, no sponsorship keeps things informal and the informality of the event was part of the beauty of it. It allowed people to be flexible. For example I knew I wouldn’t be there until quite late, I would never turn up to a formal event two hours after the official start time. For me pre-payment is a no. It takes away from the informal social element of the event. I think half yearly is fine. I am sure some organic tweet ups will take place in the meantime. If too many start to spring up numbers to each will surely drop. I think the summer months will be fine. Although there is a chance more people are away there is also the chance that some people are less busy and able to make it. Fridays tend to be bad for me as I usually make plans quite far in advance for Friday evening. That could just be me though. Whilst I absolutely love the idea of a flash mob of lawyers I am not sure it really works. We are not really a profession known for its spontaneity. Most importantly, I think some advance planning is necessary in order to ensure people are free. I usually know what I am doing most evenings two to three weeks in advance. travisthetrout on 27/03/2011 at 12:21 pm. I was unable to attend last time (due to it being midweek and already being committed to a firm event). But the tweet-up sounds great and I would love to be able to go. As I am not based in London a Friday would be a much better day for me to attend (unless I convince my London office (or a client) that they need me for a couple of days). Heather Townsend on 27/03/2011 at 3:23 pm. Firstly, thank you to Brian and Linda for organising a great event. I enjoyed putting many names to many tweets – which was my sole objective for attending. 2. Keep it informal & this means, no badges or payment on the door. 5. We had the tweet up in London, and it depends on where the demand is coming from. I personally like piggybacking on another event where lawyers are attending, and this gets around the location issue a bit.